This Evolution of Technology series article focuses on the rotary telephone or as our guest co-author Professor Weber likes to refer to our recent old telephone past – Reflections on Prehistoric Telecommunications. When boxing up possessions to remove from a room I’m remodeling as a functional home office, I recently came across my first address book. It is about 6” square, with alphabet tabs to organize the contents, and a cover of brown leather and golden piping. The book came into my possession when I was about 13 years old and I used it through the end of college. In its pages today appears not one single cell phone number, email address or Twitter account, since I retired the book well before mobile telecommunications, the Internet and social media were features of our world! I do, however, notice the phone number of my first serious girlfriend… and of the older boy who drove me to my job as a summer camp junior counselor… and the math teacher who tutored me on Saturday mornings. 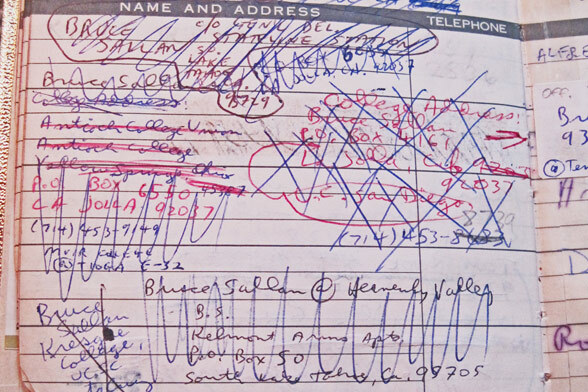 Many addresses and phone numbers are crossed out—people relocate, after all. To some of the names I can no longer put faces; and many people in the book whose names I remember well are now deceased. 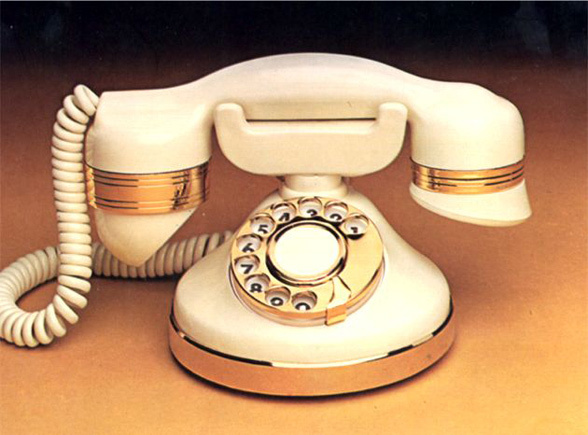 All of the telephoning I am describing was done on a rotary phone. Some of my 19- or 20-year-old students tell me they don’t know how to operate one. You picked up the receiver and listened for dial tone (which doesn’t exist on mobile phones). 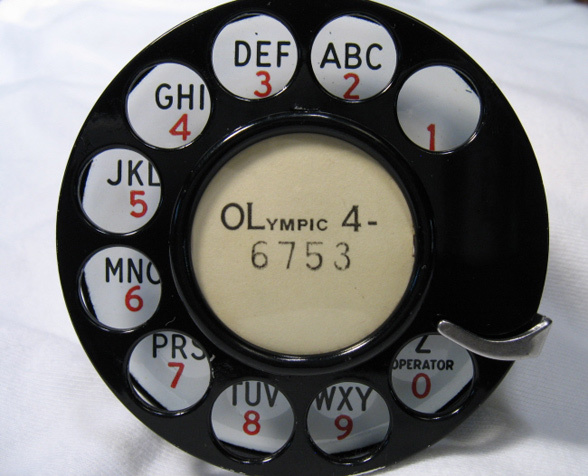 You placed your finger in a hole labeled with a number, 0 through 9, and a set of sequential letters of the alphabet (You can see the same basic configuration on a desktop push-button phone, but not on most mobile phones). With your finger in the hole, you spun the dial clockwise motion, producing in the process a satisfying “zzzzzttt!” noise. Your finger stopped when it hit a small curved bar, at which point you removed your finger and let the dial spin counterclockwise back to its resting position. You immediately repeated these steps for the next digit in the telephone number. Our telecommunications language has not fully caught up to our technology. Today, when we enter a phone number to make a call on a mobile phone, say, we poke, jab or punch alphanumeric keys, or speak numbers into a hands-free device. Support documents refer to this as “keying in” a telephone number, but almost everyone I know still calls it “dialing a number”—as if we were still using rotary-phones. My mom taught me to say, “Hello, David Weber speaking,” to answer a ringing phone, (After 50 years, I still use a variation of this greeting). In contrast, when you receive a call on a mobile phone, your screen may display the name of who’s calling, and that may determine how you greet the caller. If “unknown number” appears on the screen when the phone rings, you may not bother to answer. Yet in the days of rotary phones, with no screens to read and no caller ID to inspect, every incoming call was an “unknown number” call, in that you had no idea who the caller was until you picked up? When I turned 16 my parents gave me a phone number of my very own—my own private line! Dialing out didn’t click on any other phones in the house, so I could, and did, call friends late at night. No one could listen to my calls because there were no extensions to my personal phone number, only that one phone in my room. All phones I ever used in college were rotary phones. In my freshman dorm, I had a party line—one number shared by students in four rooms. Incoming calls could be for any of the students; whoever answered the phone would have to track down the person it was for and announce he had a call. You could not make a phone call if someone was already on the line when you wanted to use it. After a few months of this frustration, I persuaded my roommate that we should switch to a telecommunications plan, more expensive than a party line, which assigned one number to one dorm room. Today, in the dining room, I have a rotary phone—cleaned, reconditioned and functioning perfectly—manufactured half a century ago, and purchased in an antique store a couple of years ago. 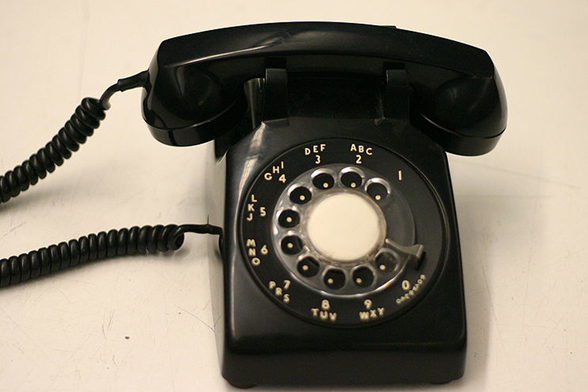 I make calls on it by spinning its dial, stopping at a curved bar and enjoying the “zzzzzttt.” I am currently shopping for a second authentic old rotary I can install it in my remodeled den. The technical term for the letters used in old telephone numbers is exchange names; the first two letters that start the old number were the first two letters of the name of a telephone exchange. 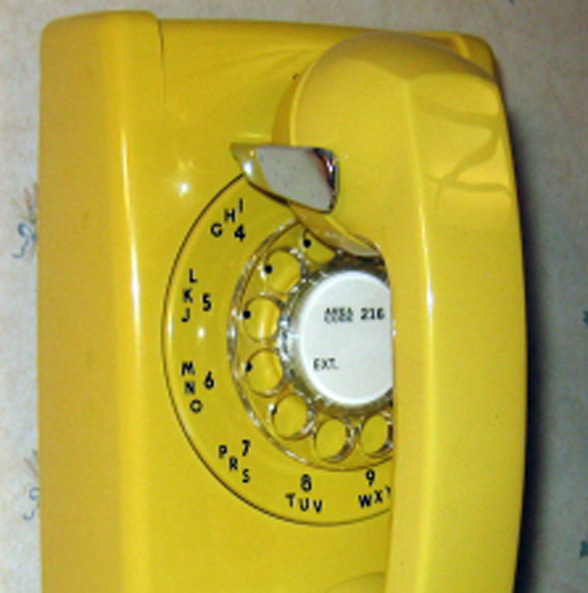 The old “Ma Bell” AT&T monopoly had launched all-digital dialing–phone numbers with no letters–and begun phasing out the use of exchange names by the early ’60s. A city as large as Los Angeles, where I grew up, would have many telephone exchanges. Thus I remember many exchange names from back in the day, including Granite, Bradshaw, Atwater, Crescent, Richmond, Triangle, among many other equally solid, no-nonsense names. My home phone’s exchange name was Vermont. Written out, my phone number was “VE” plus 5 numerals. You may know the 1940s song, “PEnnsylvania 6-5000,” and the 1960s song, “BEachwood 4-5789.” Beachwood was a fictitious exchange name; but Pennsylvania was an actual New York City exchange name (and the name of the song is even today the phone number of New York’s Hotel Pennsylvania). There’s a good reason I asked Professor Weber to collaborate with me on this series of articles. He’s good. Plus, he has such a great and detailed memory. My memory pretty much ends at what I just had for breakfast. Nonetheless, I will add a few random recollections that I’m literally pulling out of my….memory. The strongest memories I have about rotary phones are more about the way we used and thought of phones in the fifties, sixties, and seventies. We had a phone-culture that truly bears little relation to what a smart phone and modern phone technology offers. There was often just one phone in a home. Yes, ONE! It was the family phone, much as Professor described already. It was mostly used for emergencies and occasional conversation. Yes, the vintage June Cleaver mom did gab some with her girlfriends, but it wasn’t until the early ‘60s musical, “Bye Bye Birdie,” YOU TUBE and its wonderful production number, “The Telephone Hour,” that phones became so ubiquitous. Unlike modern tech devices, which can erupt and change our life patterns in a matter of weeks or months, it took much longer for such life habits to change back in the day. Plus, long-distance was verboten. It just cost too much. If, and I mean a big IF, you made a long distance call, you had better have a good reason. Usually, that meant talking to a relative, especially one that had a birthday or were suffering some ailment. We shouted into our phones during long distance calls because we actually thought we needed to because it was so far away! No joke. I want to share one last reflection on those days, which took place when I went to Europe, with my best friend, when I was 19. The idea of calling home was completely out of the question, so we instead wrote lengthy hand-written letters on the special airmail foldable envelopes called “Aerogrammes.” Postage was a factor so these lightweight paper envelopes we’d fill with words in every possible way, often writing in the smallest of print. When we traveled in Europe in the early seventies, it was relatively cheap and other students and young people would exchange tips and advice along the way. On one such occasion, some people we met told us about a broken pay phone (that, in itself, is an anachronism) that allowed anyone to call anywhere in the world. It was on a main street, in Paris. My friend and I rushed by Metro to where that phone was and, indeed, it worked just as described. We each took turns calling our friends and our family. It felt like a total miracle to talk unlimited on a phone, from Paris. There was such a joy to that “discovery!” Ahhh, times have indeed changed. I could really go on and on, but instead I invite you readers so share your memories of old phones, especially of the rotary variety.